Pattern recognition: An international tuna commission that Japan belongs to sets catch levels, then Japan is found guilty of systematic, planned overfishing. An international commission that Japan belongs to bans commercial whale hunting, but Japan continues killing whales for commercial sale, while widening its kill to more species in more regions of the world seas. During four-decade-plus membership on the Atlantic tuna commission (ICCAT), Japan has consistently demanded catches higher than the commission scientists recommend. There is plenty of blame to go around. The U.S. has be a terrible player, too, because its delegation to the commission is always infested with fishing industry lobbyists and even its science team is infected by industry consultants. With Atlantic bluefin populations now at fractions of former abundance and their numbers plummeting, the United Nations did its own review. The U. N. determined that the tuna commission had so failed that the bluefin qualifies for a trade ban under the Convention on International Trade in Endangered Species. A trade ban would knock the wind out of the fishing pressure and the prices paid, because about 80 percent of Atlantic bluefins go to—guess where—Japan. That’s because—guess what—sushi-crazed Japanese buyers pay prices sometimes exceeding $150,000 for a single fish. That’s wholesale. One fish. Bluefin tuna are now so scarce that without Japanese pay-outs, most of the fishing would be a money-loser. 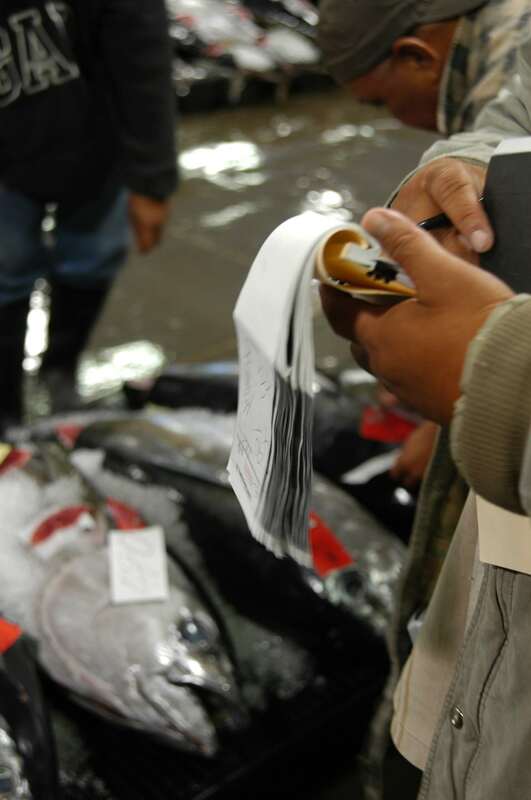 So a trade ban would likely arrest the bluefin’s tailspin and might even calm the fishing fervor enough to allow an overhaul of the tuna commission and establishment of more scientific, less corrupted management. Japan says that if a trade ban is finally enacted—it will simply ignore it. That means that Japan is announcing its creation of a massive black market for bluefin. With the fishing situation so much worse now, the trade ban proposal is gaining much more momentum. The vote will come in March when about 150 countries convene in Qatar to vote on an array of wildlife trade proposals. Japan’s announcement that it will ignore the vote of a global organization it belongs to is like running a pirate flag up the mast. In an increasingly crowded world where shared management is the future’s only hope, Japan consistently harms efforts to struggle toward agreement. When it comes to the ocean, Japan is a truly a piratical nation. What Somalia is to oil tankers, Japan is to tuna and whales. With characteristic shamelessness, Japan’s top fisheries negotiator said his country “would have no choice” but to ignore a ban. “It’s a matter of principle,” he said. This makes me angry….you don’t want to know what I really think! Jasen, which part makes you angry, Japan’s actions or my take on Japan? I never feel so angry as when I read stuff like this. I just cannot see how one can argue for this fishing. I remember watching the news when Australia busted japan for illegally overfishing their tuna. The Japanese argument was that the rest of the countries are not thinking correctly. That they need to look at stopping fishing of sardines, anchovies and pilchards. That this is the real problem. I find this argument weak. Just because overfishing of these bottom of the food chains species is wrong does not therefore mean you are right. Just there all wrong. So angry. Such a smokescreen. And Japan’s pirate tactics are working – member governments of the IWC are falling over themselves to appease Japan and award them with commercial whaling quotas, after all their years of avoiding the ban through scientific whaling. AND without actually stopping them continuing scientific whaling – just ‘reducing’ the quotas by a few hundred whales (for how long we wonder)! Here Japan – have your pie, and our pie and all the pies in the world and eat them all. Disgraceful. Sorry my lack of grammar was an indication of how angry I was, and how fast I was writing mid rant!! !